I am a JetBrains fashion victim. 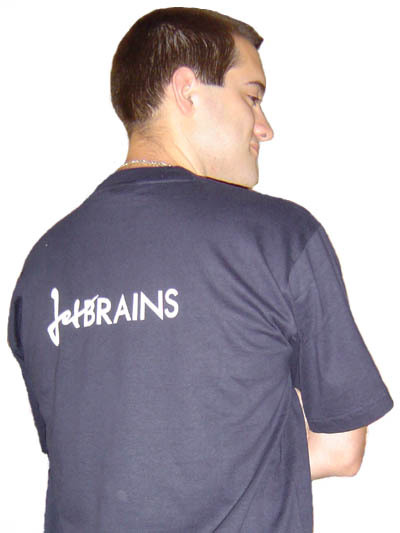 I've just received my JetBrains TShirt this morning. But indeed, the day has come, and I got this TShirt that you can see on the picture on the left: Yes, that's me who's wearing proudly that nice TShirt. This week was quite interesting also because I've been awarded a GMail account, thanks to a little game of magic number that Alain Ravet launched. The game was a draw: both Dmitry Lomov (from JetBrains) and me were the closest to the magic number. But Alain's dog decided between the two. And Dmitry won. But Robert Beeger had another GMail invitation left, so he offered it to the second: me! Thank you Robert for your GMail invitation, I'm very grateful to you. Now it's time to have fun, so have a nice Week-end everybody. And thank you very much JetBrains for my TShirt.